They are from paintings by Dennis Noble who imagined how they may have looked when they were first built. Fisgard built in 1860 and still in operation! Located on Vancouver Island at the entrance to Esquimalt harbour, it was the first lighthouse built on the west coast before BC was part of Canada. Built by the British it now is home base for the Royal Canadian Navy. Inside the building are two floors of exhibits dealing with shipwrecks, storms, and the everyday working equipment of the light keeper a century ago. A specially-made video evokes the loneliness and isolation that was the lot of the l9th century keeper. Louisbourg built in 1734. It was for the 250 anniversary of the first lighthouse in Canada that this series was designed. Located across the harbour from the Fortress of Louisbourg on Cape Breton Island, Nova Scotia, it had a 70' tower built by the French and was severely damaged by the British in 1758. The lighthouse that stands there now is the third one and was automated in 1989. It is not open to the public. Île Verte built in 1809, was the only lighthouse on the St Lawrence River for 21 years. Île Vert is an island at the mouth of the Saguenay River. The original circular form and height (17') of the tower is still intact. It was automated in 1969, but for 137 years was operated by four generations of the same family with very little alteration to the buildings (wood siding over the original rubblestone was added). A restoration in 1983 by the Coast Guard replaced the original windows and front door. Gibraltar Point built in 1808 on the Toronto Islands. The tower was originally 67' high and had a 15' extension built in 1832. Not much has been altered with this lighthouse since, including the wooden stairs inside. It no longer serves as a lighthouse and is rumoured to be haunted. In 1815, the first keeper, a Mr Rademuller may or may not have been murdered by some soldiers seeking some of his home brewed beer which he refused to offer as they were already in a drunken stupor. Some bones and bits of a coffin were later found by the third keeper, but nothing has ever been determined... some claim to have seen, or felt, his ghostly presence over the ensuing 200 years. The lighthouse was decommissioned in 1956 and is now closed to the public. It is a favourite of mine. I've been loathe to use them, but maybe now that I've taken photos I can let them go. These are lovely. I do like a nice lighthouse! A lot of our walks on holiday this year ended up on some rocky point with a lighthouse. I have come to really appreciate lighthouses and have been seeking them out more and more. They are a perennial favourite, I think. I am still amazed at all the different designs. Beautiful set. 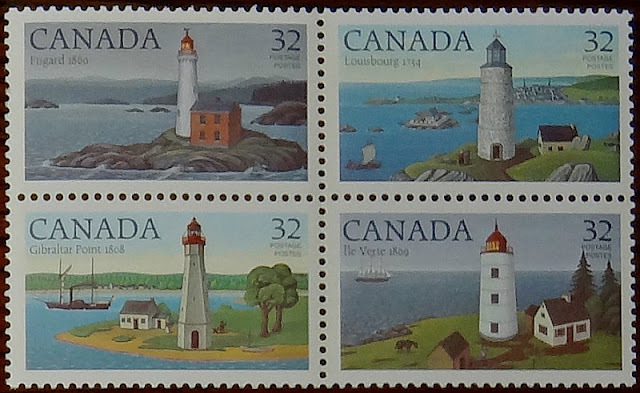 I have no Canadian lighthouse stamps. I'll have to check on eBay. if you want any used ones, let me know! They are a favourite - right up there with birds, I think! Great set complete with a ghost. I had never seen this set, I love it. I was in Île Verte some years ago, and I keep the nicest memories.